The Graduate School held their 10th Annual Poster Competition for doctoral research students on Weds 13th May in Newton Hall on Avenue Campus. The event offered research students the opportunity to showcase their work, practice their presentation skills, discussing their research with a non-specialist audience, and a chance to win a prize of £100 or £75. Seven judges, a mix of University staff and Board of Governors, plus an external judge from the Open University, chose one first and three second prizes. 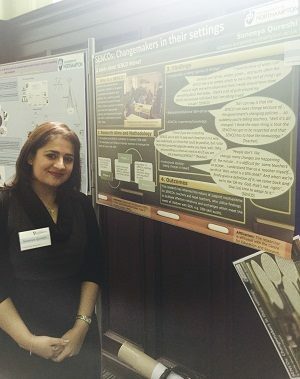 Saneeya Qureshi, from the University of Northampton’s Institute for Social Innovation and Impact, was awarded the first prize of £100 with her poster, ‘SENCOs – Changemakers in their settings’. Saneeya’s research has investigated the impact of SENCOs – Special Educational Needs Co-ordinators – and how SENCOs motivate teachers to manage the needs of children with special education needs. 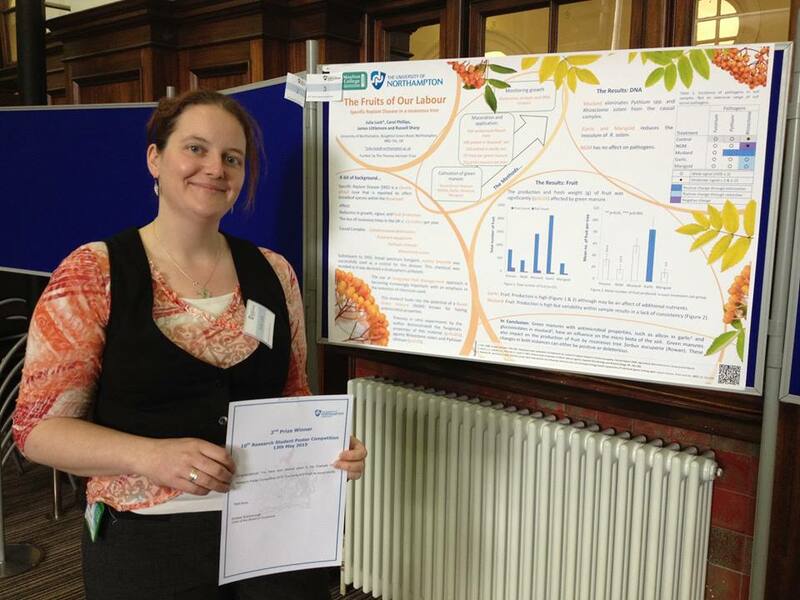 Second prizes of £75 were awarded to Julia Lock, from Moulton College, with her poster on plant disease in rowan trees, Nutmeg Hallett, from the School of Health, whose research considers violence prevention in mental health nursing, and Charmaine Sonnex from the School of Social Sciences, whose research focuses on rituals used in Paganism. Photos and the wining posters can be seen here. Posted on May 19, 2015, in Competitions and awards, Events and tagged Graduate School, Poster competition. Bookmark the permalink. Leave a comment.